Abstract. Bodega Marine Reserve (BMR) is located west of the town of Bodega Bay, California, on a spit of land forming Bodega Harbor; part of the reserve rests within the boundary of the San Andreas Fault zone, which at this location is about two miles wide, and is subject to northwesterly movement along the fault. The roughly 200 meter square survey area within the Reserve is at the NE corner of a protected cove, Horseshoe Cove, on the open coast just north of the promontory of Bodega Head; one hundred foot high bluffs mark the southeast side of the cove, and on the northwest side there is a low rise to flat table grassland, the site of the UC Davis Bodega Marine Laboratory (BML). The survey site is located on the west side of the San Andreas fault, and consequently the substrate of the site is composed of Pleistocene deposits of granitic rock and quartz diorite. The adjoining Bodega Head State Marine Reserve is a fully protected no-take reserve extending three nautical miles offshore, established by the state legislature and managed by the California Department of Fish and Wildlife, which is contiguous with the Gulf of the Farallones National Marine Sanctuary. The adjacent UC Davis Bodega Marine Reserve has restricted public access to provide for university-level research and education. Access is controlled to protect long-term field research sites from disturbance, and the Reserve is gated and posted to limit unauthorized access. Mussels (Mytilus californianus) and barnacles (Balanus) are plentiful in the area surveyed, however we found no sea stars (excepting one bat star, Asterina miniata) or sea urchins, and only one shore crab. 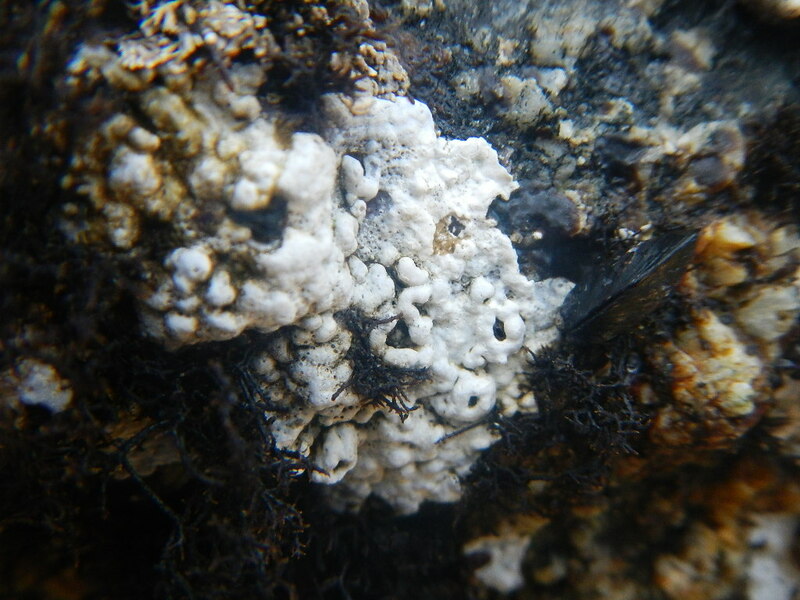 As is the case at other sites observed, Endocladia muricata is abundant in the upper intertidal zones and covers much of the rock surface, however Petrocelis (the encrusting phase of Mastocarpus papillatus) is not so prevalent. Counts of marine herbivores ̶ limpets, littorines, and chitons ̶ were low in proportion to the amount of E. muricata and appear insufficient to impact colonization of open space by E. muricata and other algae. BML staff mentioned appreciation of volunteer general surveys such as this one because, while valuable for tracking long-term changes in the intertidal zone, there is funding only for more specific studies. We hope that this survey will come to the attention of the many trained observers from BML who frequent the survey area and that they will respond with comment on our findings and discussion. Introduction. This document is the fourth of six that report the findings of our 2014 study of the ecology of intertidal invertebrate and marine plant communities from south of Point Conception to north of Point Arena on the central California coast. The primary objective of the study is to record detail of environmental conditions and catalogue invertebrate species at selected survey sites. Secondarily, further evaluation will be made of one species, the owl limpet Lottia gigantea, previously observed in 2001 at Fitzgerald Marine Reserve in Moss Beach CA. Finally, related topics of previous research on the intertidal ecology of the California coast will also be considered as opportunity permits. The data underlying this report is in the accompanying Bodega Marine Reserve Field Data Sheet (see under category “Field Data”). That document contains detail observations of conditions and specimens in each of the four intertidal zone, as well as photographs of the specimens cited here. Survey Site. The site surveyed for this report was Horseshoe Cove in the Bodega Marine Reserve (BMR) at Bodega Bay CA, latitude 38°19’06.06″ N, longitude 123°04’16.04″ W, on the Sonoma County coast 60 miles northwest of San Francisco. The location is open coast about one mile above the north bight of Bodega Bay; it is approached through a diverse coastal scrub, sand dunes, salt marsh, and wetlands. A sand beach curves around the northeast end of Horseshoe Cove, and low shelves of rock define the shoreline of the northwest side of the cove, where harbor seals are frequent visitors. The rocky intertidal zone in the north part of the cove near the sand beach was recommended by BML staff as best suited for this survey and least likely to interfere with nearby harbor seals or with areas where other studies were underway. This site was characterized by shallow outcrops of granitic rock and quartz diorite with numerous surge channels below a low bluff that protects the intertidal from north winds. A transect of 14.5 meters was set out in Zone 2, and another of 8 meters in Zone 3, and 16 meter-square quadrats were surveyed; counts in Zones 1 and 4 were made by observation. The following environmental conditions at the start of the survey period were recorded. Air temperature: 60° Fahrenheit (15.5° centigrade). Water temperature: 58° Fahrenheit (14.4° centigrade). Methods. Mapping of the site was confirmed by reference to California Geological Survey, and National Oceanic and Atmospheric Administration (NOAA), maps. On-site survey methods utilized Transect B of 14.5 meters and ten quadrats in Zone 2, and Transect A of 8 meters and six quadrats in Zone 3, to identify and quantify organisms in an area of roughly 220 square meters. The larger rocky intertidal expanse encompassing the survey area was about 50 meters by 150 meters, or 7500 square meters, when exposed by a minus tide. In Zones 1 and 4, the less rigorous approach of visual observation and scaled estimation of species abundance was employed in an environment where marine algae nearly completely covered the granitic substrate and specimens did not occur evenly distributed over a level substrate [Murray, et. al., “Methods for Performing Monitoring….”]. Data for each Zone were recorded separately. Zone 1. This zone at BMR is composed of gray outcrops of granitic rock above horizontal shelves covered in marine algae. Barnacles are abundant on the higher rocks, and also in the lower part of the zone free of the E. muricata and the encrusting tar spot algae Petrocelis. Tar spot algae occurred over about 20% of the upper Zone 1 rock surface, however E. muricata covered as much as 70% of the area. Zone 2. In this zone, Petrocelis is not so prominent, however E. muricata still covers up to 70% of the rock surface. Mastocarpus papillatus, stunted Turkish towel, is mixed in with the E. muricata and occupies perhaps 20% of surfaces. Tegula funebralis, black turban snails, are common near the Mastocarpus in numbers of about 24 per square meter. Another encrusting algae, which tentatively we are calling calcified encrusting coralline algae, occurs over perhaps 20% of the rock face. An unidentified brown algae, possibly the basal system crust of Analipus japonicas, clings to an estimated 3% of this transect. Tentative identification by Kathy Ann Miller, UC Berkeley, based on photo review only. See the photos in the Bodega Marine Reserve Field Data Sheet. On bare rock surfaces, the common barnacle Balanus glandula (BML note: more likely C. dalli/fissus) is abundant at 240 per square meter, although quite a few tests are dark inside and show no terga or scuta (all barnacles shells were counted together without regard for this). Small numbers (2.3 per square meter) of the northern striped dogwhelk, Nucella ostrina, were seen together with these barnacles, suggesting that the barnacles in this survey zone are prey of the dogwhelks. Lottia (Acmaea) digitalis, ribbed limpets, are occasional at about 7.6 per square meter, and L. scabra, rough limpets, less so at 2.3 per square meter. Rare, very small, solitary mussels were found here also. Pin cushion algae (Cladophora) occupies about 9% of the Zone 2 rock surface, along with about the same amount each of sea lettuce (Ulva), coral weed (Corallina), and rockweed (Fucus). A few periwinkles (Littorina planaxis/keenae) were seen, and just one shore crab. Inside the border of the survey, colonies of Anthopleura elegantissima, aggregating anemone, occurred along the base of vertical rock faces in numbers averaging 30 per square meter, and two or three Anthopleura xanthogrammica, giant green anemone, could usually be found in each square meter. Zone 3. This zone presents much the same range of species as Zone 2 but with lower counts. E. muricata occupies about half the rock surface in this zone, and Petrocelis, Mastocarpus, Cladophora, Fucus and Egregia menziesii, feather boa kelp, appear each on less than 4% of the surfaces. Spots of encrusting red algae, and calcified encrusting coralline algae, are seen here and there, but Corallina and Ulva increase and mix with surf grass (Phyllospadix) as they approach Zone 4. An unidentified brown algae, possibly Analipus japonicus, is present in the same amount as in Zone 2. 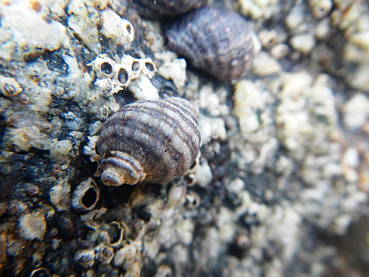 Tegula and Lottia decline in number as do dogwhelks, ribbed limpets, rough limpets, and the tiny, solitary mussels noted in Zone 2; a few slipper shells (Crepidula fornicata) were found on Tegula. Colonies of Anthopleura elegantissima continue into this zone along with the solitary Anthopleura xanthogrammica. Of uncommon interest was a hairy hermit crab (Pagurus hirsutiusculus) in a Nucella ostrina shell ̶ this species, with its white-banded legs and huge crushing claw, is more often seen in northern California than its southern cousin Pagurus samuelis. We made a short video of hirsutiusculus. One bat star (Asterina miniata) was also observed. Zone 4. This zone was taken up by the usual surf grass (Phyllospadix), coral weed (Corallina officinalis), sea lettuce (Ulva sp.) and sea cabbage (Saccharina sessilis) as well as some feather boa kelp. Wide beds of Anthopleura elegantissima flourish nearby, outside the survey area, mantling flat rock shelves several meters square in densities approaching 300 per square meter. That they persist in this unusual configuration may be because the area is protected and has restricted public access. Discussion. The small scale of observation for this survey is understood to be inadequate to support any substantial conclusions. Larger samples studied over time will always yield more useful data. Therefore, discussion here is intended more as a point of departure for further inquiry. Local geology. The survey location is situated in an area west of the San Andreas Fault, where Bodega Head and Horseshoe Cove are located; the bedrock there is composed of granitic rock and quartz diorite that has shifted northward with the Pacific Plate. The granitic rocks of Bodega Head are now partly covered by flat-lying and gently dipping uncemented to weakly-cemented deposits, probably of Pleistocene age and younger Recent deposits. The Pleistocene deposits appear to be near-shore marine and non-marine deposits, such as beach and adjoining sea floor deposits, tidal marsh or fresh-water lake deposits, interstratified marine and non-marine terrace deposits of alluvium and colluvium derived locally from steep shores, and minor windblown sand [Schlocker, 1963]. Algal Cover. E. muricata is abundant on nearly all the rock surfaces of the survey area that are not settled by mussels. Zone 1 largely is unpopulated bare granitic rock, but the upper portion of Zone 2 is exposed granite covered by E. muricata and Ulva, and the lower rock surfaces in Zone 2 and Zone 3 are covered by E. muricata (±70%), Ulva (±20%), and Egregia (±15%). Petrocelis is not so prominent here as other locations surveyed and occupies only 10% to 15% of the substrates. The abundance of E. muricata in the Bodega Marine Reserve is consistent with our other survey findings all along the California coast. Hunt (2006) noted that a gradual rise in sea level over the past 100 years, measured at Hopkins Marine Station, Pacific Grove CA, has been accompanied by an increase in the upper limit of E. muricata, which may in part explain the large presence of this algae in the higher intertidal zones at BMR and elsewhere. Rock surfaces crowded with E. muricata would seem to impact the recruitment and settlement of other intertidal plants and animals, and at our other survey sites we have seen very few species together with E. muricata ̶ an occasional Tegula, limpet, or Ulva is all ̶ so we observe with interest the large colony of mussels among E. muricata at BMR. This is consistent with the suggestion of researchers that mussels sometimes prefer settlement in E. muricata, and that Mytilus larvae often settle in Endocladia (O’Clair and Lindstrom, 2000). Endocladia. The charts above, Relative Zonal Occurrence for invertebrates and marine algae and plants, show a decided imbalance at BMR between populations of E. muricata and marine herbivores. When grazers are absent from an E. muricata assemblage, and other conditions permit, the algae will colonize surrounding open space, and when grazers are present, algal recruitment of open space declines [Walder 1999]. So, it would appear that one common constraint on E. muricata growth is not present in the BMR intertidal community, and that the number of grazing invertebrates is not sufficient to interfere substantially with algal recruitment. A deficit such as this would be abetted when an abundance of Endocladia prevents recruitment and settlement of herbivorous gastropods by reducing the open space needed for grazing. Species Diversity. Barnacles and mussels, while uncommon at some other survey sites, are abundant in the BMR intertidal zone. Missing from our BMR survey are sightings of sea stars, in particular Pisaster ochraceus (one bat star, Asterina miniata, was seen), the purple sea urchin S. purpuratus, and shore crabs such as Pachygrapsus crassipes. No owl limpets were encountered. The absence of intertidal urchins may be the result of a catastrophic die-off of urchins and several other species, including sea stars and abalone, that took place on the Sonoma coast, from south of Bodega Bay north to Anchor Bay, in August of 2011 at the same time as a large red tide algae bloom [DFG Marine Management News, 2011]. Perceptible recovery of urchins in this more protected part of the intertidal zone does not yet appear to have taken place after more than two years (BML note: Urchins, and Pisaster ochraceus, are likely to be encountered in more wave-exposed areas). Understanding of the dynamics of biodiversity in the California coast intertidal zone is further complicated by the presence of star fish wasting syndrome in the Pacific coast population of sea stars, as well as the dearth of detailed information regarding the true scope of the impact of these catastrophic events on marine invertebrates of the intertidal communities surveyed. Nucella. N. Scott Rugh [Differences in Shell Morphology…, 1997] in correspondence informed this author that “The striped species of dogwinkle was formerly known as Nucella emarginata. Now it is known that this is two species, with a northern species, Nucella ostrina, and the name N. emarginata is used for the southern species. The two overlap somewhere around central California, around the northern limit of N. emarginata and the southern limit of N. ostrina.” Ostrina was the identification chosen for the specimens found by this survey, based on the shell morphology and range map for Nucella ostrina shown at Thomas Carefoot’s website A Snail’s Odyssey. Balanus. Barnacles observed in this survey appeared to evidence a higher mortality than at other survey sites, judging from the number of empty tests encountered. The survey neglected to distinguish between barnacles with intact terga and scuta, and those with empty tests, so data from this survey cannot be used determine mortality statistics for the population surveyed. Three situations were observed: (1) apparent victims of Nucella predation, (2) barnacles enveloped by Petrocelis, and (3) barnacles enveloped by calcified encrusting coralline algae. Nucella ostrina occur in moderate numbers in the survey area, often among barnacles on bare rock faces. There are mussels about 30 meters distant from the transects of this survey, probably too far away for these Nucella, so it seems likely these are preying on Balanus here. Several barnacle tests in the photo have dark openings, which probably indicates there no longer is a living animal within. 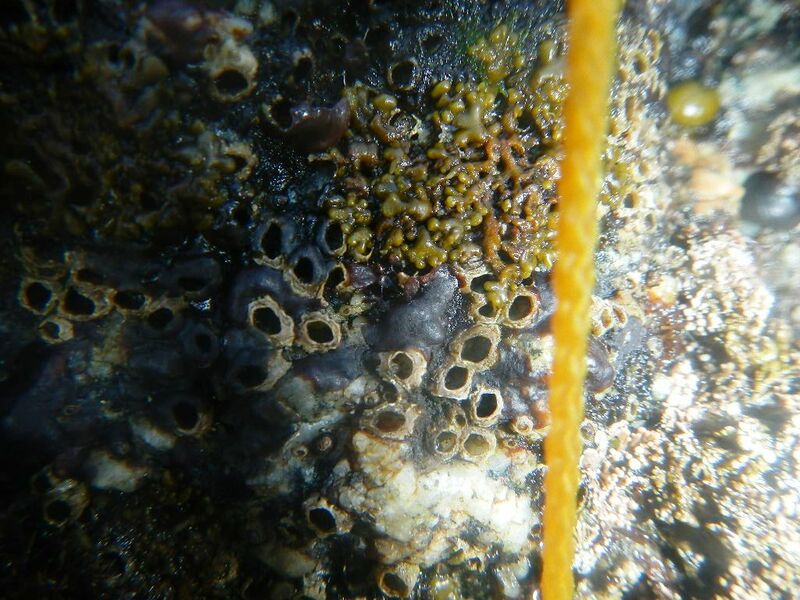 The Petrocelis in this photo appears to be enveloping the barnacles – the barnacles are not on top of the Petrocelis, but rather the algae has moved up the sides of the barnacles, over the edge of the tests, and down into the test. In many barnacles, no terga and scuta can be seen, and the test appears empty. Terga and scuta can be seen inside a few nearby barnacles not touched by Petrocelis. In this photo Balanus appear to have been engulfed by calcified encrusting coralline algae. It is not possible to tell if the algae is responsible for barnacle death and, considering the presence of Nucella, is seems more likely the barnacles were already dead when enveloped by the algae. An interesting question is whether living barnacles have any defense against being enveloped by algae, or whether they need any. All barnacle shells were counted together without regard for their appearance, but perhaps subsequent counts should determine which barnacles are living and which are not and count each separately to provide some idea of mortality rates in a specific area. Carefoot, Thomas H., Pacific Seashores: A Guide to Intertidal Ecology, University of Washington Press, Seattle, 1977. Carefoot, Thomas H., A Snail’s Odyssey website. Glynn, P., Ecological studies on the Endocladia muricata-Balanus glandula association in the intertidal zone in Monterey Bay, California, Beaufortia 12: 1-198, 1965. Hunt, Luke John Hoot, The Rise Of Endocladia Muricata: Punctuated Change At An Abrupt Range Edge, PhD Dissertation, Stanford University, 2006. Lutz, Joe, Algaebase, Mastocarpus papillatus. Metaxas, A., & Scheibling, R.E. (1993), Community structure and organization of tide pools, Marine Ecology Progress Series, 98, 187-198. Murray, S.N., Effectiveness of marine life refuges on southern California shores, California and the World Ocean, 1453-1465, 1997. Murray, Steven N. et. al., Methods for Performing Monitoring, Impact, and Ecological Studies on Rocky Shores, U.S. Department of the Interior, Minerals Management Service, Pacific OCS Region, Camarillo CA, and Southern California Educational Initiative, Marine Science Institute University of California, Santa Barbara, CA, March 2002. O’Clair, Rita M. and Sandra C. Lindstrom. North Pacific Seaweeds, Alaska: Plant Press. 2000, referenced at https://depts.washington.edu/fhl/mb/Endocladia_Laura/ecology.html. Raimondi, Pete, et. al., Monitoring of rocky intertidal resources along the central and southern California mainland, 3-Year Report for San Luis Obispo, Santa Barbara, and Orange Counties (Fall 1995-Spring 1998), OCS Study, MMS 99-0032, U.S. Bureau of Energy Management, Regulation, and Enforcement, Pacific OCS Region, 1999. Ricketts, Edward F. and Jack Calvin, Between Pacific Tides, 3rd ed. and 5th ed., Stanford University Press, Stanford, CA, 1939 and 1985. Rogers-Bennett and Patyten, Abalone and Red Sea Urchins Die During Red Tide in Northern California, DFG Marine Management News, October 2011 (access their PDF from this webpage). Rugh, Scott, Differences in Shell Morphology between the Sibling Species Littorina scutulata and Littorina plena (Gastropoda: Prosobranchia), Department of Biology, San Diego State University, The Veliger, October 1 1997. UCSC, Endocladia (Turfweed), Pacific Rocky Intertidal Monitoring: Trends and Synthesis, UCSC website, 2012. The following link is to the Excel 2007 Workbook for the April 18, 2014, Field Observation Data collected at Bodega Marine Reserve, Bodega Bay CA. This data sheet supports the Bodega Marine Reserve Survey Report for the same date (see under Category “Survey Reports”). The link opens the Excel workbook on your computer, and is about 12MB in size. The workbook has been scanned and passed by ZoneAlarm and AVG Security.